Henry Hotdog and I loaded our first video onto Periscope yesterday. Have you downloaded the app? It allows you to share a little piece of your world in realtime via video. I’m not sure why I chose to make my first foray onto Periscope with the perfect weekend morning combo of no bra, pyjamas and greasy hair – I think I may have got a bit excited about the technology. It was very cool to see the interaction as we separated the egg whites and got some whipping action from the Kitchen Aid. “Hi from Texas” was the first message. “What’s a pavlova?” was the second. Henry gave a little insight “Pavlova was a girl who was a ballerina and a chef made a dessert for her” he omitted the controversy of the time. The big question. Did this happen in Australia or New Zealand? Who can take the glory? The answer? Australia won the World Cup in the Cricket this year. Okay, so that’s not the answer. I think it may have been the Kiwis. I’ve written about our love of Maggie Fulton before, we of course use Maggie’s Encyclopaedia of Food and Cookery when making our “Pav”. Preheat your oven and get it nice and hot. Around the 230C/450F if it’s gas. If it’s electric make it 150C/300F. Add sugar, but do it slowly, just one tsp at a time. You want to keep those stiff peaks stiff, don’t flatten them by dumping too much sugar in. Stop beating when all sugar has been incorporated and gently fold in the vinegar and vanilla. Now it’s time time to pile your mixture into you base. You have a few options for presentation. You can choose to put it into a springform tin and make it smooth on top. If you’re having a dinner party you can make little individual mini pavs the size of you palm, or you can pile the mixture in a circular shape and mould the sides with a spatula and make a slight depression on top. We made a square pav yesterday. I use a flat oven tray and cover it with baking paper that I grease with butter. If you’re using a gas oven turn heat to lowest temperature, put pavlova in and bake for one and a half hours or until crisp on top and a pale straw colour. If you’re using an electric oven, put pavlova in and bake for 45 minutes, then turn oven off and leave with door shut for an hour. (My oven is very temperamental at burning things and seems hotter) I only have to bake it for 15 minutes before I turn the oven off. When your pav is cooled, you can fill it generously with whip cream. 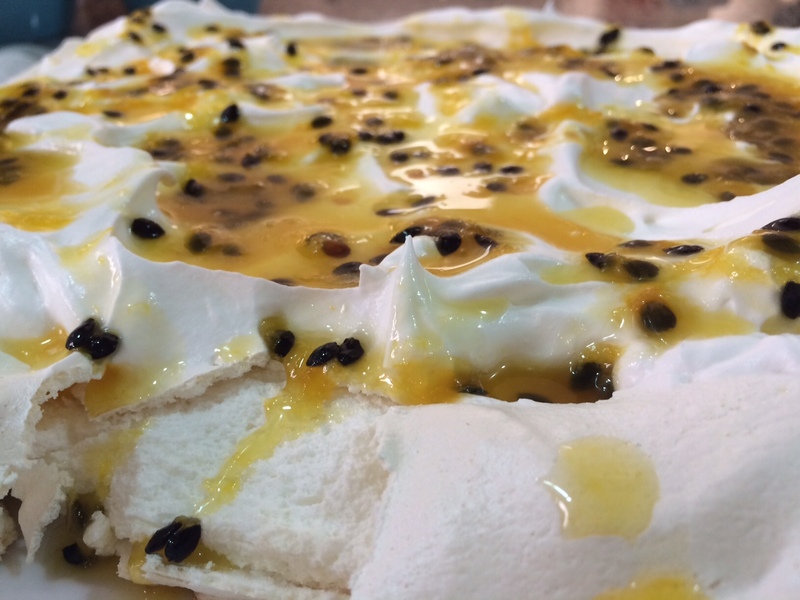 We always use tinned passion fruit that we hand carry from Oz back to Qatar each year, every good pav needs passionfruit. We used Raspberries, Blackberries, Blueberries. You can also do mango or pineapple. 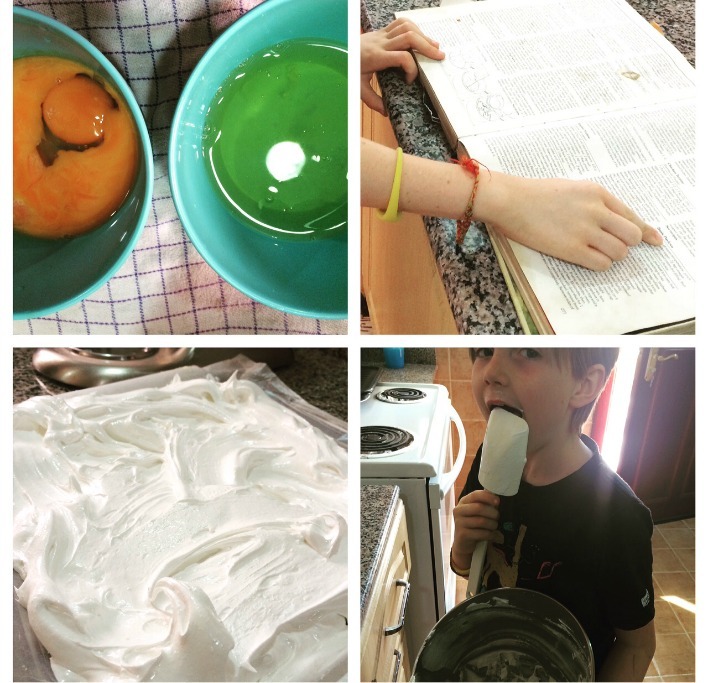 Are you a pavlova maker? My family finished off the whole thing in a twelve hour period yesterday. 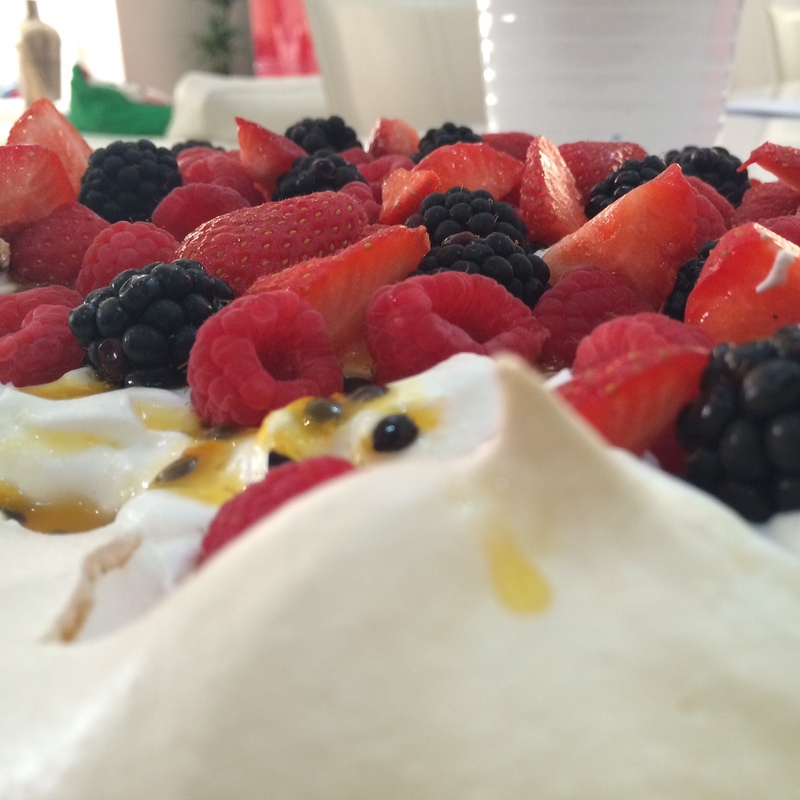 What do you put on your pavlova?